The app’s worker’s dashboard displays detailed information on upcoming shifts. Employees can see requests for shift changes and can share their ability to take shifts. If a worker wants to change their schedule they can go to Marketplace where the app uses analytics to find someone who’s available to swap. Marketplace finds matches based on a worker’s role, location and skill. The app makes schedule changes simple. 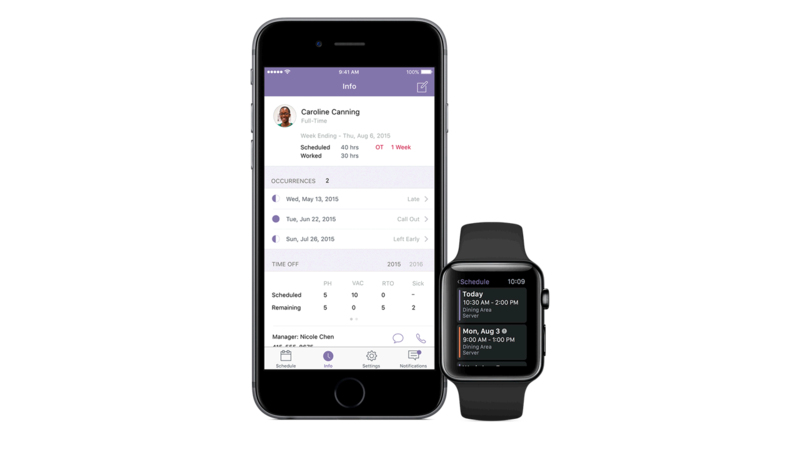 You can manage your shift and view information in real time on your Apple Watch. The app allows you to make changes from wherever you are – no more phone calls or going into a location for shift swaps. Managers are kept up to date via the app and are better able to handle all their people resources. The app gives you more direct control and flexibility with your schedule. Under the info tab, you can see time card information including scheduled hours for the week, vacation days and available time off. You can also accept or decline shift requests from other staff members. All these features combine to give greater workplace satisfaction.